Development of SiroSmelt began in 1970 in the CSIRO Division of Chemical Engineering when Dr John Floyd was assigned to investigate the reasons for the relatively poor performance of a pilot scale rotary-furnace tin-smelting process developed at the Division by Dr Ron Davey. Other key contributors to this development were Bill Denholm and Frank Jorgensen. SiroSmelt is a high-intensity smelting process employing a top-entry submerged-combustion lance centrally located in a tall vertical cylindrical vessel that provides efficient heat transfer and mixing in the molten bath. Very good environmental performance can be achieved owing to the relatively simple furnace geometry and small size of the reactor with very efficient sealing against fugitive emissions. The process has been licensed under the names Ausmelt and Isasmelt, and successfully employed for the commercial production of a wide range of non-ferrous metals, for waste-treatment and for direct iron production (on the pilot scale). Currently there are in excess of 60 commercial installations around the world varying in throughput from a relatively few tonnes per annum for waste treatment to over 1.5 million tonnes per annum for copper smelting. John Floyd’s investigations of the reasons for the relatively poor performance of a pilot scale rotary-furnace tin-smelting process revealed that the slow reaction rate was due to poor mixing and inadequate contact between slag and reductant. He thus began a series of tests promoting turbulent mixing by gas injection into liquid slags. a water-cooled vertical top-entry lance initially fired with natural gas and technical-grade oxygen to provide both mixing and submerged-combustion heating. Early test results proved so promising that in 1973 CSIRO provided Development Pool Funds to promote commercial development. David Conochie and Brian Lightfoot were recruited to the workforce, and the safe, well-designed pilot plant shown in Figure 1 was developed. Beginning in 1973 the SiroSmelt combustion-air-cooled lance was developed to replace the water-cooled version, and this was the vital break-through that ultimately led to the wide-spread adoption of SiroSmelt reactors (albeit under the licensed names ‘Ausmelt’ and ‘Isasmelt’) in non-ferrous smelting operations worldwide. reduced penetration depth and wider lateral distribution of gas into the liquid bath. The effects of swirl are illustrated in Figure 2. The shallow penetration depth of the gas jet is exploited to advantage in the SiroSmelt Tin Smelting operation where, at one stage of the process a deep slag layer covers a shallow bath of crude tin product which contains a small proportion of iron. The lance penetrates and agitates only the upper levels of the slag bath where the reduction of continuously-charged SnO2 concentrate by lump coal yields a high-SnO slag plus metallic tin low in iron. The molten tin coalesces and falls to the tin bath in the lower levels where the stagnant conditions inhibit the re-equilibration of the metallic bath with the slag. This results in a tin product with smaller iron content than would be achieved if the whole bath were agitated, and leads to substantial cost reduction in the over-all smelting and refining operation. Substantial developments and improvements to the design and operation of the lance continued during pilot-scale testing both at the Division and on many smelter sites in collaboration with industry. Originally it was assumed that the air-cooled lance could only be employed in a slag bath in absence of a ‘matte’ (molten iron sulphide) or metal phase. However in 1977 there was an urgent request from a sponsor (Aberfoyle Pty Ltd) to conduct a pilot-scale trial on the ‘matte fuming’ process, which required immersion of the lance into a highly-corrosive molten iron sulphide matte bath overlain by molten slag. In 50-kg pilot-scale tests, a number of spare lances were prepared to ensure that the test could go to completion in the event of lance failures. The first lance was pre-coated with solid slag in the usual way by shallow immersion in the upper slag bath before lowering it into the matte. To the surprise and delight of all concerned, the protective slag layer allowed it to survive prolonged immersion for 12 hours in the turbulent matte bath without damage. On the realisation that the air-cooled lance could be employed in the entire range of smelting operations, a patent was applied for and subsequently granted. In the years to 1980 there was gradual pilot-scale development of a range of slag-cleaning operations, and of smelting techniques for tin, copper, nickel, zinc and lead. In 1977 a permanent 100 kg/h pilot plant was established by the Smelting Research group at Mount Isa Mines for collaborative investigation of lead smelting (which was not permitted for safety reasons on the CSIRO site). One member of the CSIRO SiroSmelt team, Ross McClelland, developed the ‘SMELT’ computer simulation program which allowed very close prediction of the results of complex smelting operations. This contributed a great deal to the effectiveness of pilot-scale campaigns by concentrating attention on the most promising operating conditions. Tin slag cleaning and tin concentrate smelting were both successfully demonstrated in the 50 kg/h CSIRO pilot plant, after which slag cleaning was demonstrated at Associated Tin Smelters (ATS) in Sydney in a series of reactors of increasing size. Finally in 1978 a commercial-scale – 5 tonnes per hour (tph) – prototype slag-cleaning furnace was installed and operated successfully. This was the first commercial SiroSmelt operation. This furnace was also used to scale-up the early 50 kg work on tin concentrate smelting at CSIRO, and it was demonstrated in a number of successful trial campaigns that the SiroSmelt system was superior to any tin-smelting process developed before that time. It was an unfortunate twist of fate that a slump in the tin industry led eventually to the closure of the ATS plant, and consequently the very promising SiroSmelt tin smelting process was never again installed on a large scale in Australia. However it has now become the preferred smelting process in several overseas tin-producing areas (see below). A vital chapter in the development of SiroSmelt for sulphide smelting began with the decision of Aberfoyle Ltd to build and operate a 4 tph pilot plant to test the suitability of the matte fuming process for treating the pyritic Queen Hill deposit. This plant was commissioned in 1980 on the Kalgoorlie Nickel Smelter site (to take advantage of existing infrastructure and skilled personnel). This furnace with 2 m internal diameter and internal height of 4.2 m was the largest yet constructed at that time. Its successful operation proved the viability of the matte fuming process and provided a mass of important operating data to assist with further development of SiroSmelt. Unfortunately the slump in the tin industry soon after this time led Aberfoyle to abandon the Queen Hill deposit and the matte fuming process. However, the 4 tph plant was later purchased and transported to Mount Isa Mines where it played an important role in further developments of the SiroSmelt system for both lead and copper smelting. The larger scale operations at ATS and Kalgoorlie revealed an important potential limitation of the SiroSmelt lance as then employed. The combustion air was initially accelerated to sonic velocity in the swirler region, and this required large high-pressure air compressors with high capital and maintenance costs and large power demands. Over the next few years an enormous effort was expended by all parties in the mathematical analysis of the fluid flow patterns in the lance, leading to the design of efficient swirlers. As a result, modern SiroSmelt lances with diameters sometimes exceeding 500 mm are now blown using efficient low-pressure blowers with oxygen enrichment up to 60 per cent, while still maintaining the protective slag layer during immersion. 1981 was a critical year in the SiroSmelt story. Following the slump in the tin industry and the abandonment by ATS of tin smelting (the only commercial scale SiroSmelt development at that stage), there was an apparent lack of interest from Australian industry. The Chief of Division considered curtailing further work on the process, and John Floyd made the courageous decision to leave CSIRO and form the company Ausmelt in an attempt to accelerate adoption of the technology. Dr Bill Denholm who had been closely involved with the project in a supervisory role since 1974 as Leader of The Pyrometallurgy Section took direct control of further research. With the intention of allowing Ausmelt to develop non-ferrous applications of SiroSmelt he initially directed the Division’s SiroSmelt research effort towards direct iron smelting, and secured a Research Grant (NERDDC Application No.82/2212) for this purpose. Ausmelt was becoming a prominent player in the smelting world, and Dr Floyd was joined by his former CSIRO lieutenant Brian Lightfoot. The Metallurgy Department at Melbourne University was closed, and the Extraction Metallurgy staff and facilities were transferred to the Department of Chemical Engineering. Dr Floyd became a part-time Adjunct Professor. The Chemical Engineering Research Group subsequently formed the nucleus of the GK Williams CRC for Extractive Metallurgy, one of the Centres of Excellence for Applied Research, initiated by the Hawke Government, and supported by Universities, CSIRO and Industry. Dr Floyd became part-time Director, and some Department Staff members and post-graduate students studied topics relevant to SiroSmelt technology in Master’s and PhD projects. Some of these PhD graduates subsequently made important contributions to the industrial development of the SiroSmelt system. The Smelting Research Department at Mount Isa Mines (MIM) having embraced SiroSmelt technology as the preferred route to lead smelting, resumed intensive collaboration with the Division in laboratory-scale studies and in pilot-scale operations at Mount Isa. They sought and obtained CSIRO permission to adopt the name ‘Isasmelt’ for any processes developed on their sites. Mount Isa Mines also needed to replace their obsolete Reverberatory Copper Smelter, and had initiated collaborative investigation of SiroSmelt as an alternative route for copper smelting. At the Division, the new Chief Dr Batterham actively embraced SiroSmelt as an important component of the Division’s research activity and encouraged close collaboration with industry. With a now smaller workforce the approach to smelting research was changed, and a refined technique was developed for conducting small crucible-scale tests which could then be confirmed if required by a small number of pilot scale tests. Rob Taylor took charge of the pilot plant, and assisted in the conduct of the laboratory crucible-scale testwork. after solidification, all products were sampled and analysed. The adoption of these techniques with occasional confirmatory pilot scale tests enhanced the productivity of the smaller group. The ferrous smelting project ‘Iron Production With Coal Gasification’ was initiated in early 1983, supported by the initial one-year NERDDC grant for Iron Smelting research and Dr John Wright was appointed as supervisor. Very promising results were achieved, but changing circumstances led to a re-direction of the group’s research effort. An alternative direct iron smelting process was at the time in an advanced stage of development by CRA Ltd in collaboration with the German company Maxhutte. Another group within the Division was collaborating in this research, and to avoid wasteful duplication of effort, the SiroSmelt iron-smelting group became part of a larger group from the Division which contributed to the successful development of the process known as HiSmelt. The HiSmelt project was very successful, and a semi-commercial pilot plant has successfully operated for many years at Kwinana in Western Australia. Of equal interest, Ausmelt Ltd more recently developed the successful AusIron process based on top submerged-lance technology, and also operated a successful pilot plat at Whyalla, South Australia. Unfortunately, neither process has yet been taken up for full scale operation at a steel production site. By 1984 MIM Ltd were heavily committed to ‘Isasmelt’ development for lead and copper smelting, and had filed a patent for the Isasmelt lead process. The remaining SiroSmelt team became involved in extensive collaborative investigations both at the Division and on site at Mount Isa Mines. Detailed descriptions of the early developments by CSIRO, Ausmelt and Isasmelt can be found in the Proceedings of the Mervyn Willis Symposium, organised by the GK Williams Cooperative Research Centre at Melbourne University in 1992. Successful industrial development of a technique such as SiroSmelt requires resources far beyond those available to a Division of CSIRO. The technology was, therefore, licensed to Ausmelt and Mount Isa Mines, and both companies have vigorously pushed for its adoption in smelters around the world. On-going supporting research by CSIRO has continued and is described later. Both licensees usually refer to the SiroSmelt technique as TSL (top submerged lance) Technology. Both the Isasmelt and Ausmelt groups have been very successful internationally because they offer a complete know-how package with excellent technical support to solve problems encountered by the client. One of the winning features of the TSL technology is the outstanding success of automatic process control and this assists in the highly successful transfer of operating know-how to plant operators. An attractive feature of TSL installations is the relatively small ‘footprint’ which permits retrofitting into otherwise crowded sites. To accommodate the lance-lifting mechanism the buildings must be quite tall, as can be seen in Figure 4, the Jingjang Smelter building in China. Early industrial scale development of Isasmelt occurred at the Mount Isa smelter site, leading eventually to the development of full-scale plants which could be used to demonstrate the advantages of the technology to potential users. The Mount Isa Operations are now owned by Xstrata, and the Isasmelt processes are marketed by Xstrata Technology. The history of Isasmelt development is adequately described by Burford B in 2009 [‘The ISASMELT® Technology Package: Over 30 Years of Innovation’, The AusIMM Bulletin 1]. In the case of ‘Lead Isasmelt’, following successful pilot-scale tests, a 5 tph demonstration plant was built in 1983, using the reactor purchased from Kalgoorlie. Only the first (oxidising) stage of the process was operated commercially, and the high-lead slag product was fed to the existing lead blast furnace, leading to a very cost-effective increase in lead production. In 1991 a two-stage 20 tph plant (60 000 tpa) was built, incorporating both an oxidising smelting stage and a slag-reduction stage in Isasmelt furnaces. This was operated successfully until 1994, when it was mothballed due to shortage of lead concentrates. In lead smelting, the first smelting stage is simple and reliable, and produces lead bullion and a high-lead slag, with negligible refractory wear and efficient capture of gases for recovery of sulphur. The system involving first-stage smelting in an Isasmelt reactor followed by reduction of the slag product in a lead blast furnace tends to be favoured by Xstrata Technology’s clients, and has recently been installed in smelters in China and Kazakhstan. Copper smelting was demonstrated first at the Mount Isa Smelter site in the 5 tph furnace followed by a 15 tph demonstration plant in 1987, leading to a full-scale Copper Isasmelt operation treating 1 000 000 tpa of concentrate in 1992. 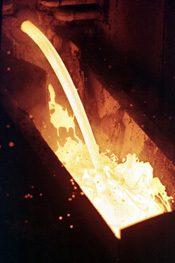 By February 2009, ten Isasmelt copper smelters had been installed worldwide with concentrate feed rates up to 1 300 000 tpa. The matte product from the smelting stage can also be continuously converted to blister copper in the so-called ISACONVERT® TSL process but this has not yet been installed in a commercial smelter. Ausmelt quickly built a 100-kg scale pilot plant to investigate proposed smelting operations, but not having its own full-scale production facility, the Company needed to establish its reputation by the installation of a series of initially relatively small operations at sites around the world. These included copper smelting at Roxby Downs, zinc fuming at Korea Zinc and Hachinohe, Japan, tin smelting at Pisco Peru and secondary metal operations. In later years Ausmelt technology has been applied successfully to copper, nickel, lead, zinc, on an increasingly large scale, and to the treatment of lead and copper secondary materials and wastes. Copper and nickel concentrates have been treated at rates up to 1 500 000 tpa in furnaces up to 5 m diameter. Batch copper converting is carried out in an Ausmelt reactor at the Tongling Jingchang Copper smelter in China, and Ausmelt has also developed the so-called C3 continuous copper converting process, with very successful trials conducted at Zhong Tiao Shan, China, in September 2007. A smelter using this process is currently under construction. This and the corresponding Isaconvert process can permit significant simplification of copper smelters, with simplified material handling, improved environmental impact and efficient recovery of sulphur. Ausmelt has also become the preferred technology for new tin smeling operations. Liuzhou China Tin will be the fourth main tin manufacturer worldwide to adopt Ausmelt smelting technology. Two of the world’s biggest producers, Minsur and Yunnan Tin, have already operated large Ausmelt plants and Bolivia’s Vinto smelter will install a new unit in 2010-11. Sixty Ausmelt furnaces of varying capacity have been installed worldwide. A good historical survey of Ausmelt developments from 1984 is presented by Hughes et al 2007, Ausmelt Technology-Developments in Copper, Metalexpo 2007. In January 2010, Ausmelt was acquired by the Finnish conglomerate Outotec, and is now known as Outotec® Ausmelt. extensive thermodynamic modelling of metal, matte and slag phases to allow accurate prediction of the composition of products under a given set of operating conditions. In particular the multi-phase equilibrium (MPE) model provides a rapid user-friendly way of estimating the phases present in a wide variety of slags. improvements to the 50-kg pilot plant, particularly induction heating of the metal bath to allow fuel and air/oxygen rates to match those expected in full scale operation. Since Bill Denholm’s retirement in 1990 the Pyrometallurgy program has been led by Dr Sharif Jahanshahi, whose particular personal interest is the development of the MPE (Multi-phase Equilibrium) Models, while the SiroSmelt support activities were supervised by Dr Frank Jorgensen, now retired. In 1992 the SiroSmelt patent was challenged by an overseas Investment Corporation, and Dr Jorgensen was heavily involved for more than one year in fighting and eventually beating the challenge on behalf of CSIRO, Mount Isa Mines and Ausmelt. In recognition of their contributions to smelting research Bill Denholm was made a Member of the Order of Australia (AM) in 1996 and received a Sir Ian McLennan Achievement for Industry Award in 1990; John Floyd was made a Member of the Order of Australia (AM) in 1997 and received a Clunies Ross National Science and Technology Award in 1995; and Frank Jorgensen received a Clunies-Ross National Science and Technology Award in 1999. In addition the licensee, Xstrata Technology (Isasmelt), won an Austrade Large Services Award in 2008. Dr Floyd has been honoured in several ways by the international metallurgical fraternity including the John Floyd International Symposium on Sustainable Developments in Materials Processing, was held in his honour at Hilton on the Park, Melbourne from July 3-6, 2005. His opening address as well as the article ‘John Floyd: in time with civilisation’s metal march’ (follow the link in Related information below) present a historical record from his point of view of the development of the technology to full commercial application. Denholm WT, 2010, Personal communication.